We have great Luau birthday party ideas for your Luau theme party, incorporate the best birthday party ideas into your party. Let your daughter greet guests when they arrive, and give each guest a leis necklace and a flower for their hair. Check out our cool invitations ideas for your Luau party. It doesn't have to be difficult to make invitations, here are some easy examples! To make this Luau birthday party invitation you need to use empty water bottles with cap or corks. Make an invitation using your computer. Roll the invitation up and secure it with a raffia bow and put it in the bottle. Add some sand and shells into the bottle. You can mail the bottles with a label on the outside. To make this invitation you need to use seal zip-lock plastic sandwich bags (with some glue), file the bags with water, glitter, small shells and attach a little pink or green paper with the party details on it. This invitations are hand delivered. Use various designs for invitations: like palm trees, surfboards, tiki men, tiki women and pineapples. Use your computer for this and let you daughter colour the pictures by hand, finish it off by putting some glitter on the invitations. Put the invitations in envelopes filled with little sand and 1 or 2 shells. "Name" is invited to "name" Hawaiian Luau Birthday Party! The Magical Luau Birthday Party will be held "date and time" to "time" at "location". To RSV please call "number" by "date". Please dress appropriately for some Wet & Wild Fun! 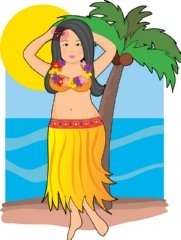 Let the birthday girl wear a Hawaii skirt and ask guests to wear tropical attire to the Luau birthday party. The theme colours for the Luau birthday party is blue, green and yellow. So hang lots of balloons and streamers in these colours. Cut palm trees and a sun out of cardboard and decorate the walls. Put big shells, real or fake flowers on tables or on the floor. Bring your plants to one room or one area were most guests will be, creating a tropical look. Hang fishnets from the ceiling if you are having the party at night. You can also use coloured Christmas lights covered with netting. Put beach balls in the pool, inflatable palm trees, floating rings, inflatable monkeys, hula teddy bears. Have tropical music playing in the background. Use a light blue table cover and bright paper plates, cups, napkins, mini umbrellas, straws etc. Decorate your table with leaves of roses and seashells. If the kids are old enough put 4-5 big white candles on the table with sand and small seashells inside the candle holder (also put this candles all over the party). For centrepiece make a bouquet of balloons. For the kids that are not wearing a grass skirt, let them make one. These grass skirts can be made out of crepe paper strips or strips cut from a large green plastic garbage bag. Or can be made by wrapping a green sheet of crepe around the waist and cutting fringes from the bottom hem up to the waist. Our Luau birthday party games are so popular, that we have a whole section just dedicated to Luau party games. Below are some few examples of Luau games. But if you want more games then click away to our Luau party games section. Fruit Decoration - Good game for smaller kids. Let the kids choose a picture of a fruit and let them colour it. Who in the Water? - Make two teams and set up a long rope between the pool. Let each team member try to pull the opponents into the water (repeat 3-4 times). Hula Girl Piñata - Finish the Luau birthday party with a piñata, kids love this! Fill the piñata with lots of tattoos and candies. We have lots of yummy ideas for food and drinks for the Luau birthday party. Pick 4 or more of these yummy refreshments! BBQ with Hawaiian flair: Hotdogs, burgers and chicken. Salads: Serve different types of salads- potato salad, bean salad, pasta salad, etc. Hawaiian Pizza: Buy ready made pizza dough and let the kids make there own Hawaiian pizza, with toppings like pineapple and ham, etc. Lots of Fruit: Serve lots of fruit- pineapple, bananas, watermelon, etc. Hawaiian Punch Make a punch with pieces of pineapple and watermelon. Hawaiian Soda: Serve coloured soda or juice. Get little mini umbrellas to stick in the drinks and lots of colourful straws. Check out our cool Luau birthday party cake idea. Make 1 sheet cakes and decorate 1/2 of the cake blue like the ocean and the other 1/2 as land (use crumbled graham crackers as sand). Make a small bundt cake and frost it in chocolate frosting. Put the bundt cake on top of the sheet cake- left side of the sheet cake "land side". Decorate the 1/2 of the sheet cake with mini palm trees, small umbrellas and mini dolls wearing grass skirts. Before serving, take a pint of chocolate ice cream and place over the hole in the centre of the bundt cake, pour strawberry syrup over it for volcano lava. Let guests leave the Luau birthday party with goody bags filled with their piñata findings and their homemade lei, a little inflatable beach ball, a mini towel (pink for girls and blue for guys) and the hula skirt they made. Make the actual goody bags by putting yellow, blue, green, reed glitter around the corners of green, blue, yellow lunch bags. Take lots of pictures in the Luau birthday party. Afterwards scan the pictures into your computer, put Hawaiian flower border around it. After printing them out, put a little Hawaiian flower on the back of the thank you note. Lastly, get them laminated and give them away to everyone that came. Something more easy? Just write a thank you note from your computer with Hawaiian flower border around it and send the pictures you took of the guests to them via email (as an attachment)! I hope our party ideas will help you in your planning and I hope your princess will love and enjoy her Luau birthday party . If you have great Luau birthday party ideas or pictures please SHARE share them with us.